Pratham Software (PSI) has a well-established Quality & Security Management System, combined known as Management System (MS). MS is an integrated system of processes aligned with PSI’s Quality & Security policies. 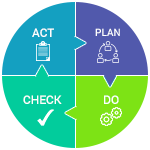 MS is based on the Plan-Do-Check-Act (PDCA) cycle of continuous improvement. The processes under MS are continuously aligned to the changing business needs and are flexible to accommodate the client-specific needs. The continuous improvements are driven through collaborative management with active participation from the practitioners. PSI’s India development centre is ISO 9001:2015 and ISO 27001:2013 certified. Being certified with ISO standards is a reflection of PSI’s efforts to comply with the operational standards from a global perspective. It is also in line with the organisation’s focus on leadership, innovation, and continuous improvement.